For 11 years, the Mazzies of East Meadow, NY, had been raising puppies for the Guide Dog Foundation. The family taught the basics, like house training, socialization and good manners, and then at one-and-a-half years old, the dogs were turned over to the Foundation. Read the story in Pat’s words. After all those years, Ken Mazzie wanted a break and a dog of his own. He started searching on Petfinder. “The first time I saw Winky’s photo, I felt sorry for her,” he says. 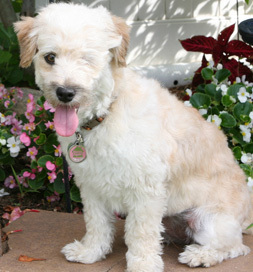 When found, the pup was suffering from an eye infection; her left eye had to be removed. Her coat was matted and flea-ridden. Precious Pups Rescue in Lake Ronkonkoma, NY, listed her on Petfinder, and Ken spotted her. Through Petfinder, Winky happened onto the perfect match.